On April 24, 1915, the Ottoman state "sent notice to the provinces... with the aim of stopping the activities of the Armenian gangs who had killed innocent people, rebelled against the state, and made cooperation with the enemy." Of course, that's not quite how Armenians see it. 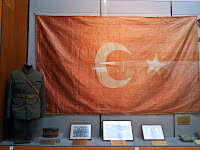 It is, however, how history is told in the "Belgelerle Ermeni Sorunu Salonu" (Armenian Problem with Documents Room) at the Istanbul Military Museum in Harbiye. 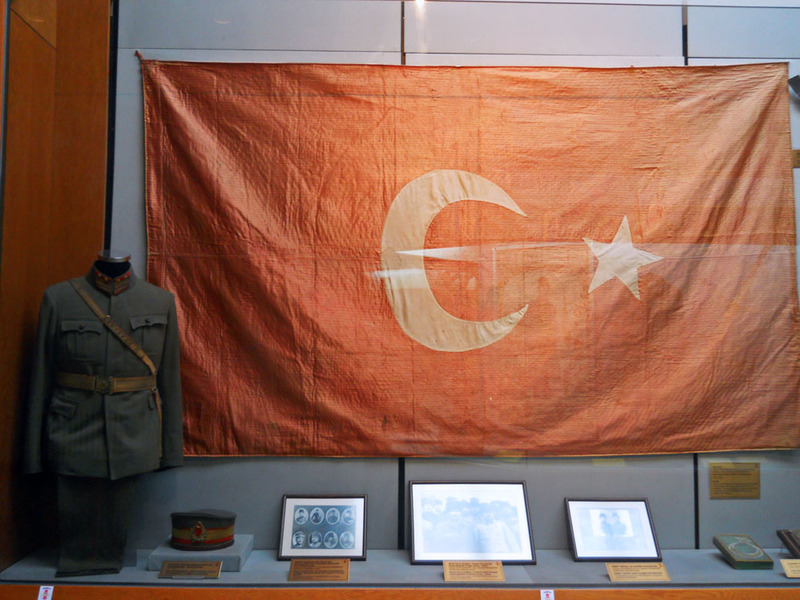 That small chamber on the museum's upper level, part of its WWI display, does indeed contain a few documents -- on the "circumstances necessitating the relocation" of the empire's Armenians -- as well as the bloody shirt of a pasha killed by an Armenian assassin in Berlin. 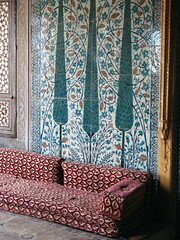 The bulk of its holdings, though, are photographs: of bombs and weapons captured from Armenians, of members of "Armenian gangs," of mosques burned to the ground by Armenians, and gory image after gory image of Turks (including children) set on fire, hacked apart, bound and left to die, even fetuses pulled from their mother's wombs. The imagery was deeply disturbing on at least two levels -- because of its content, most certainly, but also for the single-minded determination to depict a country as made up of only heroes and martyrs that it represents. Let me be clear: I am well aware that many Turks contest this formulation, and that my own country is no stranger to erasing (or manipulating) inconvenient historical facts. I also have no illusions that the presentation at a counterpart museum in, say, Yerevan would be any more nuanced. But looking at such official portrayals of history, it seems unfortunately easy to understand how people's beliefs about the "other" can be formed and reinforced, and how this can contribute to creating intractable tensions between two parties. Somber thoughts for a museum best known for its colorful but mind-numbingly repetitive mehter band performance. 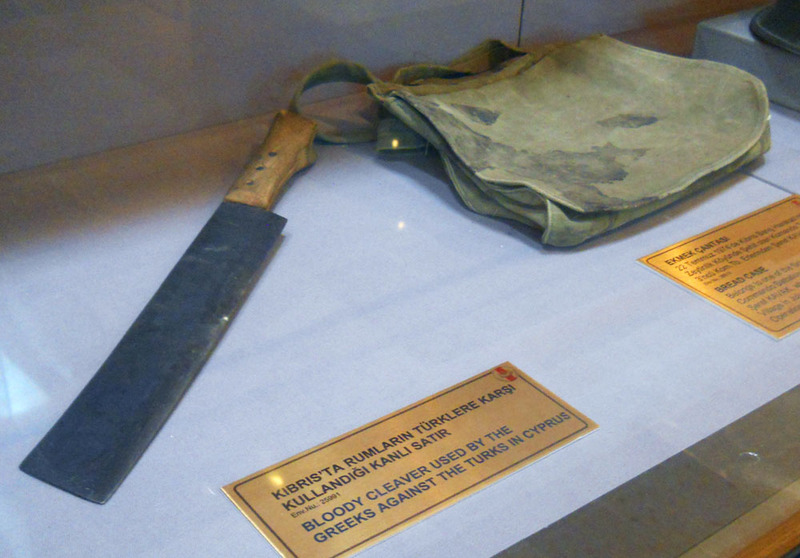 With such ideas on my mind as I continued exploring the museum's collection, one artifact stood out in the nearby area devoted to the Korean and Cyprus conflicts: a "Bloody cleaver used by the Greeks against the Turks in Cyprus." "Sheep's head is usually served roasted or boiled," I said, pointing at the flesh-covered skulls in the corner of the butcher's case, their tongues lolling out between stubby teeth below their bulging eyeballs. "Here's the sheep's liver, and its heart. And did you see the cow tongue back there?" I asked my tour group, indicating a chunk of whitish meat roughly the size and shape of a human forearm. 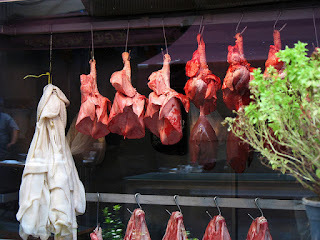 "No, no," one of the butchers interjected. "It's kaynana tongue." I racked my brain for the meaning of the unfamiliar word. Was it water buffalo, like the animal whose liver he'd already said was even bigger than the massive cow liver on display? No, that's manda. Was this little shop alongside the Spice Bazaar doing a secret trade in exotic animal parts? Perhaps I should have paid more attention during that useless-seeming Turkish 1 lesson where we studied the words for "giraffe" and "kangaroo." The butcher repeated himself, clearly dismayed at my still-quizzical expression. "Are you married?" he asked, pointing to his ring finger. I shook my head. "That's why you don't understand..."
As I continued explaining the different types of offal to my guests, the other butcher took pity on me. "Senin beyin annesi," he said with a slight smile. Tomorrow I'll have to tell them that we have a plant with the same name -- one that's sharp and a bit poisonous.